Wellington Power Corporation has most recently utilized BIM on the UPMC East project with a total value of $24,500,000. Over the course of this project Wellington employed BIM for coordination both internally and with other trades (identifying and mitigating clashes), as well as for construction sequencing. The usage of BIM resulted in elimination of redesign, better collaboration between Wellington and project partner trades, and, ultimately, enhanced performance. Wellington Power Corporation also utilized BIM modeling for the recently completed UPMC/Presbyterian radiology department for coordination. 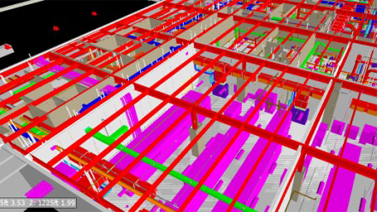 On the UPMC East project the development of "as-built" BIM models was largely a collaboration between Wellington's Project Executive and General Foreman and all necessary subcontractors. The process included frequent on-site meetings with Wellington's Virtual Construction Developer to ensure accuracy of the "as-built" model. When possible, these appointments were regularly scheduled and face-to-face. If time or distance did not allow for this, Wellington worked to verify that all information was transferred in compatible formats and no data was lost in the file sharing process. Staff at Wellington are currently pursuing CM-BIM certifications for continued proficiency with updated BIM concepts and their usages. Coursework, including BIM Units 1, 2, 3, and 4 have been completed and are on-going.